If you are in Sabah during the beginning of May you will be able to enjoy the colourful Sabah Harvest Festival or Kaamatan that is celebrated by the Kadazandusun people of Sabah. 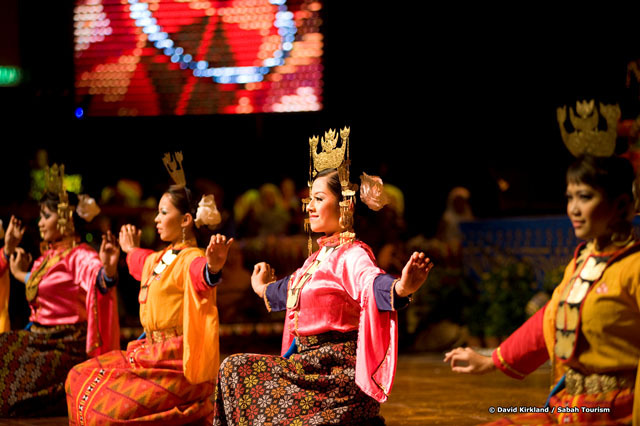 This vibrant Sabah Harvest Festival will sure to dazzle you with its showcase of rich Kadazandusun cultural heritage. The Kadazandusun of Sabah celebrates the Sabah Harvest Festival or Kaamatan annually to give thanks for the bountiful rice during the rice harvesting period. Kaamatan is the largest festival in Sabah and is celebrated statewide by the Kadazandusun people. The Kadazandusun has been celebrating this Sabah festival for several generations from the time when these people were collectively agrarian rice planters. During the harvest time the Kadazandusun community would work hand in hand gathering the rice stalks with special knives said to be able to appease the rice spirits. This festival in Sabah begins on the first of May and reaches its climax by the end of May where there will be a lot of festivities and merrymaking. One important feature of this festival in Sabah is where the local Kadazandusun high priestess would conduct a ritual inviting Bambaazon, the rice spirit, to the festival. It is believed that this festival in Sabah will not be able to commence until this spirit is present. In the far-flung past, this ritual would be conducted under the first full moon in the rice field where there would be a procession through the field led by a warrior wielding his sword to ward off evil spirits. Apart from seeing the traditional thanksgiving ritual, you will also be able to see various events such as cultural shows, exhibitions, traditional Kadazandusun games and buffalo races being held to celebrate this Sabah festival. Every year since 1960, this Sabah festival has been celebrated on a statewide scale where the Kadazandusun community would showcase their rich cultural heritage through traditional songs, dances, cultural shows, agricultural exhibitions, handicraft sales and of course. The local community would turn out fully decked in their colourful traditional attire. The special rice wine called tapai is served throughout the festival. You will be amazed at the various colourful activities being held during this Sabah festival. This year’s Kaamatan was celebrated all month long with various events being held throughout Sabah. The beginning of the festival was marked with a colourful cultural show held in Kota Kinabalu JKKN complex that presents a rich blend of the state’s cultural heritage. Towards the end of May, there was a Kaamatan grand finale celebration held by the Kadazandusun Cultural Association in Penampang. This place was where all the main festivities were held towards the final two days in the month of May. If you are in Sabah for the next Kaamatan festival, do make sure you mark these important dates! By the end of this wonderful Sabah festival, you are guaranteed to leave Sabah with lots of wonderful memories on the ever-vibrant and colourful Sabah Harvest Festival. Why don’t you take a trip to Sabah during the month of May and experience the sights, sounds and colours of the Kaamatan festival yourself?